Hamilton M. Peyton helped create the American Exchange Bank in 1879 by reorganizing the failing Duluth Savings Bank. The Exchange started with a capital stock of $25,000, less than $600,000 today. But under the direction of Peyton, who served as the bank’s president for most of its existence, it thrived until his death in 1928. The bank—whose name had changed to American Exchange National—merged with First National Bank in 1929, just months before the stock market crashed; the two became the First American National Bank. An Oliver Traphagen Romanesque design, the four-story, brick-faced American Exchange Bank stood on a foundation of Fond du Lac brownstone, which also trimmed its windows and doors. Its corner tower, which does not fit the building’s overall design, is thought to be a last-minute addition to please George Spencer, the driving force behind the bank’s construction. 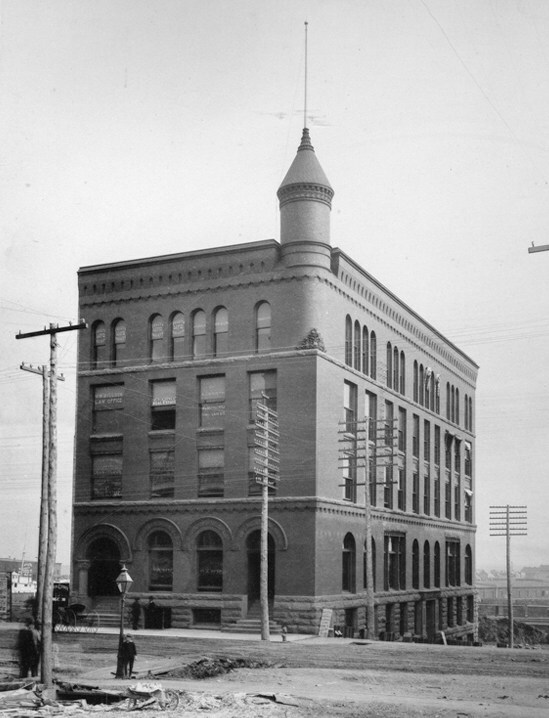 After the merger with First National, the building continued to serve downtown Duluth as the Exchange Building, which housed a number of businesses. After the Exchange Building’s demolition in September 1955, a brand new First American National Bank went up on the same lot; it later became home to Norwest Bank, today’s Wells Fargo.